Over a thousand million Christians today blindly accept that Jesus of Nazareth is the Christ. They produce "a thousand and one" prophecies from the Jewish Bible (the Old Testament) to prove their claim that Jesus was the Messiah promised to the Jews. Let us hold the "thousand" prophecies in abeyance for a moment and examine the only unequivocal claim made by Jesus in the Gospels and examine whether he fulfilled his promise to the Jews. We must admit that the word CHRIST is not a name. It is a title. It is a translation of the Hebrew word Messiah, meaning "anointed." The Greek word for "anointed" is Christos from which we get the word Christ. Priests and kings were "anointed" when being consecrated to their office. The Holy Bible confers this title even on a heathen king CYRUS (Isaiah 45:1). We are reminded in the Gospel of St.Luke that "WHEN EIGHT DAYS WERE ACCOMPLISHED FOR THE CIRCUMCISING OF THE CHILD, HIS NAME WAS CALLED JESUS, WHICH WAS SO NAMED OF THE ANGEL BEFORE HE WAS CONCEIVED IN THE WOMB." (Luke 2:21). The name that was given to Mary for her yet unborn son was JESUS and NOT Christ. It was only after his baptism at the hands of John the Baptist that he, Jesus, claimed to be the Christ. The Jews were not the ones to accept his claim on its face value. Matthew records that the learned men among the Jews - the Scribes and Pharisees - came to Jesus and asked, "MASTER, WE WOULD SEE A SIGN FROM THEE". (Matthew 12:38). What they really wanted was some "magic trick," some "sleight of hand" like producing a rabbit out of a hat or walking on the water or flying in the air or trodding on burning coal. This is the type of "sign" or MIRACLE they were looking for. The Jews mistook him for a sorcerer, a wizard, a charlatan. With righteous indignation Jesus replies: "AN EVIL AND ADULTEROUS GENERATION SEEKETH AFTER A SIGN; AND THERE SHALL NO SIGN (no miracle) BE GIVEN TO IT, BUT THE SIGN (miracle) OF THE PROPHET JONAS: FOR AS JONAS WAS THREE DAYS AND THREE NIGHTS IN THE WHALE'S BELLY; SO SHALL THE SON OF MAN BE THREE DAYS AND THREE NIGHTS IN THE HEART OF THE EARTH." Matthew 12:39-40). Jesus says, "NO SIGN." He does not refer the Jews to blind Bartimeus whose sight he had restored. He does not speak about the "woman with issues" who was healed by merely touching him; or about the 2000 pigs he had destroyed to heal "a man possessed;" or the 5000 and the 3000 people he had fed and satiated with a few pieces of fish and a few pieces of bread. "No sign," says Jesus, BUT ONE! - "THE SIGN OF THE PROPHET JONAS!" He is putting all his "eggs" in one basket. His claim to being the Messiah (Christ) stands or falls by the ONLY "sign" he was prepared to give. Surely dead men don't cry and don't pray! The answer again is "ALIVE" For three days and three nights the fish takes him around the ocean: dead or alive? "ALIVE!" is the answer. On the third day it vomits him on the seashore: dead or alive? A-L-I-V-E, of course! What had Jesus prophesied about himself? 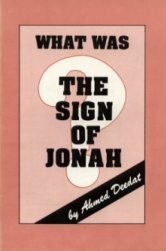 He said: "AS JONAH WAS ... SO SHALL THE SON OF MAN BE" LIKE JONAH. And how was Jonah? Was he dead or alive for three days and three nights? Alive! ALIVE! ALIVE! is the unanimous answer from the Jew, the Christian and the Muslim! If Jonah was alive for three days and three nights, then Jesus also ought to have been alive in the tomb as he himself had foretold! But Christianity hangs on the flimsy thread of the "death" of Jesus for its salvation. So it has to answer that Jesus was DEAD for three days and three nights. The contradiction between his utterance and its fulfilment is obvious. Jonah ALIVE, Jesus DEAD! Very UNLIKE Jonah! Jesus had said "LIKE Jonah" not UNLIKE Jonah. If this is true then according to his own test Jesus is not the TRUE Messiah of the Jews. If the Gospel record is genuine then how can we blame the Jews for rejecting "CHRIST". The question arises: when was Christ crucified? The whole Christian world answers: "FRIDAY!" Is this the reason we celebrate "Good Friday" - as a Public Holiday in every Christian nation from America to Zambia, from Abyssinia to Zaire at Easter? What makes "Good Friday" so good? "it is the death of Christ on the Cross on this day to wash off our sins," says the Christians. So he was killed on the cross on a Friday, 19xx years ago? From the Gospel records we gather that the Jews were in a hurry to eliminate Jesus. Hence the midnight trial, and then despatching him off to Pilate in the morning; from Pilate to Herod and then back again to Pilate. The vested interests were afraid of the general public. Jesus was their hero. He had been their benefactor. His enemies had to do away with him quickly, and succeeded in doing so. However, as much as they were in a hurry to hang him on the cross, they were in equal hurry to bring him down from the cross before sunset on Friday because of the Sabbath. The Sabbath starts at about 6 p.m. on Friday and the Jews were warned in Deuteronomy 21:23 that the victim of crucifixion was an "accursed of God" and was not to be permitted to remain hanging on the Sabbath day, "that thy land be not defiled which the Lord thy God giveth thee for an inheritance." To satisfy the religious scruples of the Scribes and Pharisees the "secret disciples" of Jesus took down the body from the cross. They gave the body the Jewish burial-bath, plastered it with "one hundred pounds weight of aaloes and myrrh" (John 19:39), then placed the shrouded body into the sepulchre before night-fall. SECONDLY, we discover that he also failed to fulfil the TIME FACTOR as well. The greatest mathematician in Christendom will fail to obtain the desired result - THREE days and THREE nights. We must not forget that the Gospels are explicit in telling us that it was "before sunrise" on Sunday morning (the FIRST day of the week), that Mary Magdalene went to the tomb of Jesus and found it empty. The Armstrong family has debunked the whole Christian world. They seem to know their arithmetic! Mr Robert Fahey of the "Plain Truth" magazine, delivered a lecture recently at the "Holiday Inn,' Durban, where I was present. Mr Fahey attempted to prove to his Christian audience that Jesus Christ was crucified on a Wednesday and not on Friday, as is supposed by Orthodox Christianity for the past two thousand years. According to him if one counts backwards from Sunday morning deducting 3 DAYS and 3 NIGHTS, one ought to get WEDNESDAY as the answer. I congratulated Mr Fahey for his ingenuity. I asked him, how was it possible for the past two thousand years the whole Christian world celebrated GOOD FRIDAY instead of GOOD WEDNESDAY. Thus the 1,200,000,000 Christians of the world today are ignorant of the correct day of the so called crucifixion! It means that even the Roman Catholic Church - which claims an unbroken chain of Popes from Peter to this day - according to Mr Fahey are mislead. "If the devil," I said, "can succeed in confusing the Christians in the most elementary things of their Faith, whether to celebrate a Good Friday or a Good Wednesday, then how much easier for him to mislead Christians in other things concerning God?" Mr Fahey blushed and walked away. If this is the belief of the trend-setters of the Christian Faith in the world today, may we not then ask: is this not the mightiest hoax in history?